Smartwatches can do just about anything you can think. They can keep an eye on how you are sleeping. They can interact with your phone in new and innovative ways. Heck, they can even tell time(I kid, I kid.) In short, the humble smartwatch has every reason to be expecting it will soon be resting on millions of wrists the world over. But what if all of the stuff they can currently do doesn’t float your boat? What if you just want a smartwatch to help you get better at basketball? Surely there can’t be anything basketball-specific coming down the pike. Think again, hoops hater. Introducing a smartwatch just for that purpose. 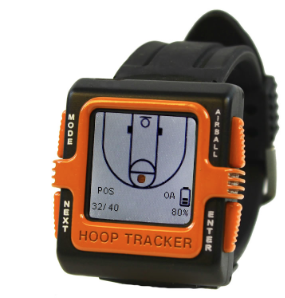 The Hoop Tracker smartwatch has one primary function, to keep an eye on your basketball shots and give you advice how to make better ones. Think of it as your very own personal Phil Jackson, only without the eastern philosophy stuff and the occasional loud mouth. This thing automatically tracks , in real time, 3 pointers, 2 pointers and all the rest of the pointers. It also keeps an eye on percentages of shots made. It does all of this automatically so you don’t have to worry your pretty little head about it. Also, it lets you know how many calories you’ve burned, like that’s the reason you get on the court. Again, it must be noted, the Hoop Tracker also magically tells the time. You can preorder one by dribbling on over(sigh) to their Kickstarter page and dunking down(sigh x2) around $99. NBA action. It’s fan-tastic.